ben (Homepage) wrote: just amazing. perfect image. so wonderful.wow. Rookie (Homepage) wrote: Wow, Excellent capture. Darcy (Homepage) wrote: Fantastic photo. Eugene Sidorov (Homepage) wrote: Wow! It's great! Heidi (Homepage) wrote: Aha! I see! You are good at this! I am looking forward to see many many more images and will klick backwards in your blog lots more now!!! syber76 (Homepage) wrote: Beautiful seascape. Alalla973 (Homepage) wrote: Un cliché comme j'aimerais en faire, c'est extraordinaire. Miles (Homepage) wrote: Wonderful composition, I love the pink tones and night sky. Anne V. (Homepage) wrote: Very peaceful and beautiful. Great photoblog. maxmitzu (Homepage) wrote: you have a great image here... is just awesome... Congrats. Amy (Homepage) wrote: This is incredible, Paolo! Really, really, really gorgeous. My god, what a good job. kEvin (Homepage) wrote: W0W! dose it really? fantastic shoot! I like this! luwi (Homepage) wrote: very nice photo, well captured! Arnd (Homepage) wrote: This really does have a magical, dreamy feel to it. Very, very beautiful! Rue Du Lavoir (Homepage) wrote: Une très belle réalisation. Même sans la lune en arrière plan , la photo est superbe. Maintenant, elle est juste parfaite! Kevin P. (Homepage) wrote: Great capture and very beautiful processing ! Andrés (Homepage) wrote: Superb image here. What a moon!!! Marcie (Homepage) wrote: Breathtaking..absolutely stunning. WOW..WOW...WOW! Arjan - PlasticDaisy (Homepage) wrote: Splendid! There is something about that special light in the evening. Claus Petersen (Homepage) wrote: Now thats what I call a beautiful moon, it's just amazing how big it is here! sherri (Homepage) wrote: Wow. I'm guessing perhaps you added portions of the sky - only because I've experimented myself. Either way it's a gorgeous image. Florence (Homepage) wrote: Fantastic twilight with this gratuated palette of colors, I love the smily face up there. Utterly poetic. Owen (Homepage) wrote: wow, truely stunning! Andy (Homepage) wrote: WOW!!!! 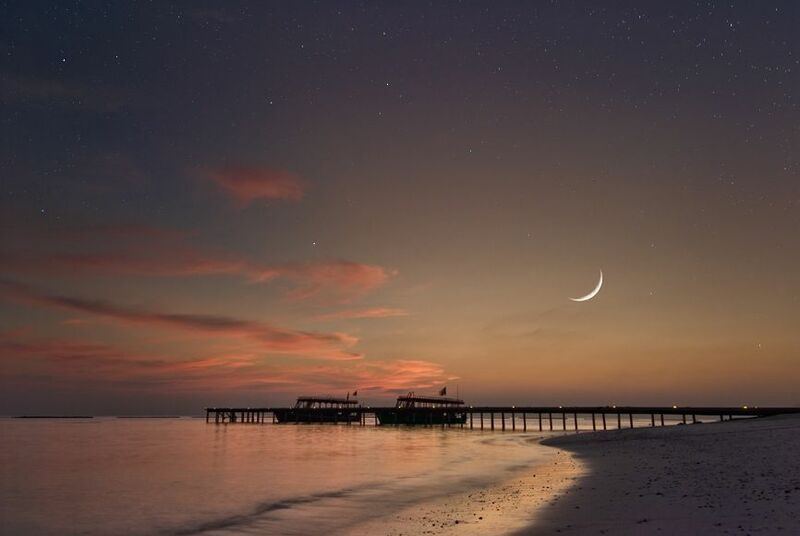 Stunning shot capturing the sliver of moon above the water and docks! Beautiful work! Guido (Homepage) wrote: La luna sembra enorme. Proprio oggi pomeriggio ho visto la nuova luna, però da noi scende presto dietro alle montagne. Peccato che le barche siano mosse, però non credo sia colpa del tempo lungo ma delle onde. Ma eri insieme a Francesco in questa serata? jess (Homepage) wrote: What a beautiful sight! There's a fantastic balance between Earth and Sky.